Jean Lacy�s home-a multilayered, multifaceted visual conversation-has become a favorite meeting place for the Dallas art community. The breakfast nook is a popular gathering spot for those not afraid of casual conversation that almost always leads to intense debate. Author Alex Haley ate Dallas barbecue in that nook. Artist James Phillips propped his tall frame in the doorway of the kitchen while guests spent hours discussing the role of the black artist in the black community, Nigerian sculptor Sokari Douglas Camp wandered through rooms, fascinated by Lacy�s collection of black dolls. Former Dallas Museum of Art director Rick Brettell was fond of dropping by unexpectedly with art collectors, museum directors and artists from all over the world. What is the attraction? Comfort? An abundance of art? The chance to network? The answer is simple: Lacy's door is always open for conversation and an exceptional cup of coffee-unless she�s at work on a project. Until recently, the project was a stained-glass-window commission. It is no wonder that the Rev. 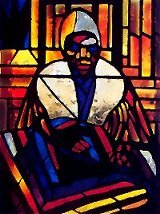 Zan Wesley Holmes Jr. asked Lacy to design stained-glass windows to complement St. Luke "Community" United Methodist Church. St. Luke has long been known for its Afrocentrism, and Holmes is well aware of Lacy�s commitment to human dialogue through art. Her images build bridges of communication between individuals and cultures. Born in Washington, D.C., in 1932, Laura Jean Lacy grew up near Howard University, where her father served as secretary to the business manager. She was introduced at an early age to the philosophical thoughts and writings of Alain Locke, W.E.B. Du Bois and other African-American intellectuals. In 1951, she followed her sister and brother-in-law to Louisiana, where her art career began. After receiving a bachelor's degree in art education from Southern University in Baton Rouge, she began teaching high-school art. Marriage to the Rev. Nathaniel Lacy meant a move to Los Angeles, where she began creating liturgical art. In the 1960s, she worked with her husband and the United Methodist Church, producing collages that helped the congregation grapple with the issues of the civil rights movement. This challenge became the catalyst for Lacy to become involved in the black community. She held art exhibitions at the church, as well as in Watts, and in the March on Washington she was one of the artists living in Resurrection City who created a graffiti wall to preserve the comments of all who went to D.C.